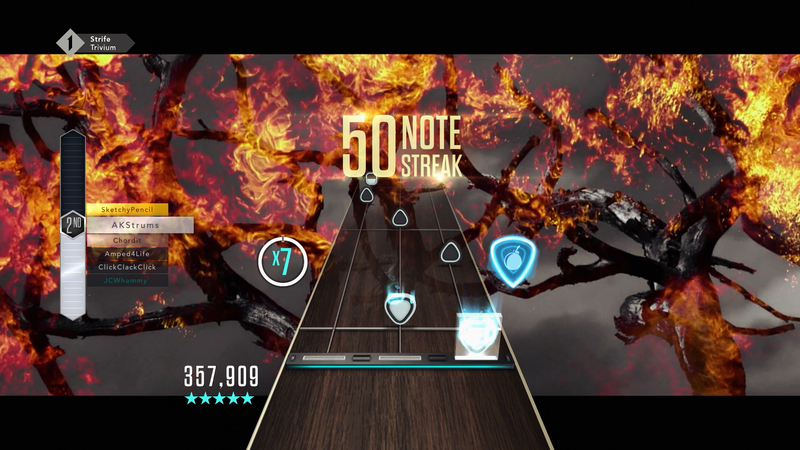 Guitar Hero is back after a five-year hiatus with an all-new guitar, and a completely new game mode. Typical. You wait five years for a new guitar-based music rhythm game to appear, and then two of them come around the corner almost simultaneously. Rock Band 4 was the first to arrive just a couple of weeks ago, and took the tack of not reinventing itself. It delivers classic gameplay that's the same as it ever was, and also offers backwards-compatibility with previously-bought songs and instruments – a very welcome touch. 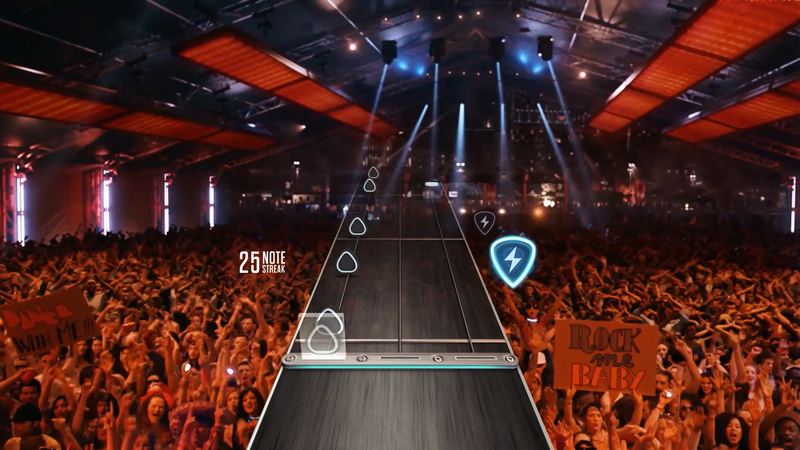 Now Guitar Hero Live has been unleashed, and that has gone almost completely the opposite route, featuring an all-new guitar, and a whole new way to play the game. It's a good move that clearly differentiates itself from Rock Band, and establishes this latest entry in the series as something new and innovative in a genre that was, up until recently, seen as somewhat stale. First of all, let's talk about that new guitar. 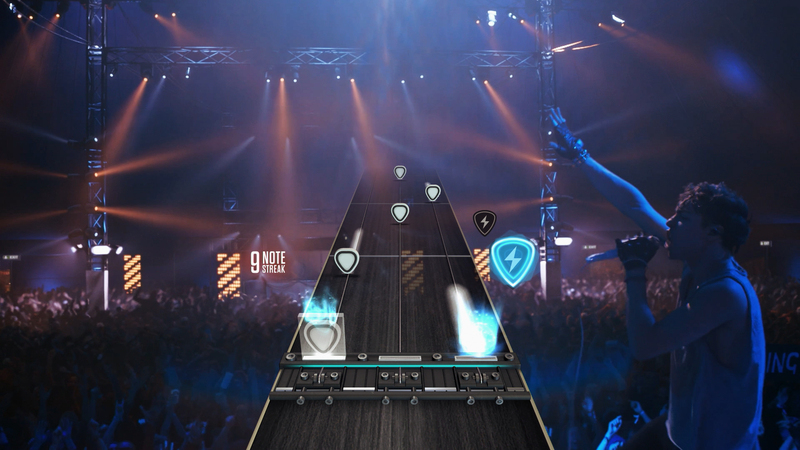 Rather than go the traditional five-button route, Guitar Hero Live's axe features six buttons – two rows of three frets, stacked one on top of the other. It's a bold reinvention, and one that in practice does actually feel more like you're making chords with your fingers. There's a lot more variety in terms of combinations, and while it takes some time to adjust if you're used to playing the old five-button guitars, practice does make perfect and after a few sessions, it starts feeling quite natural and becomes second nature. 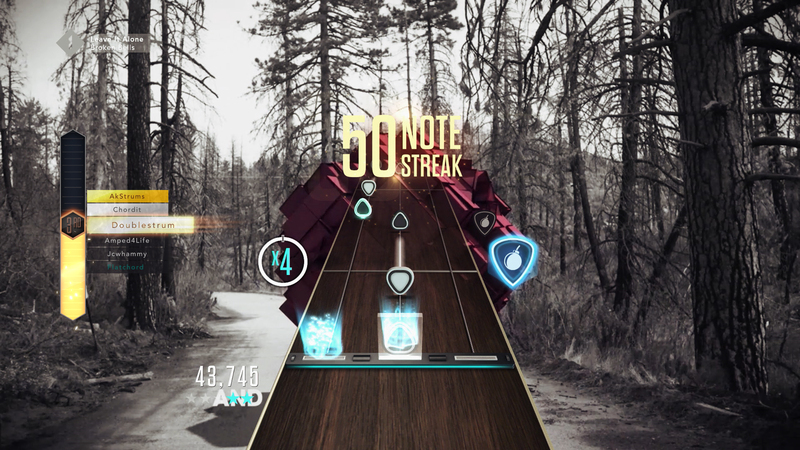 While the button layout is all-new, the note highway and way the actual game plays is fundamentally the same as before. The highway is now a three-note affair, with the scrolling tabs shown in black and white to help you differentiate between top and bottom frets. But other than that, it'll be very familiar to anyone with experience playing guitar-based rhythm games. 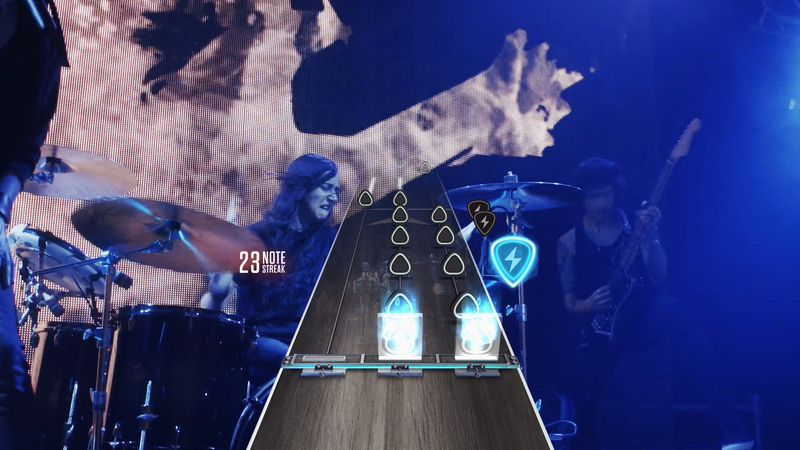 In terms of its gameplay, Guitar Hero Live features two modes: the eponymous GH Live, which is essentially a career mode, and GHTV, an always-on, around-the-clock mode that lets you play along to a myriad of new tracks that you don’t actually own. GH Live is where you take the role of a guitarist who plays for a bunch of different bands. You basically play gigs featuring the game's 42 songs, and strum along to concert footage that's filmed from a first-person perspective. It's a pretty astonishing effect, with you on stage, rocking along with your band in front of a screaming horde of people. As you do well, the crowd and your band get into the action, but if you start doing badly, you'll soon know about it – your band-mates get seriously pissed off with you, and the crowd boos and catcalls. When you finish your set, you're scored based on the number of notes you hit, streaks, and strength of your performance. I did enjoy playing along with the band, but while the video effects are very impressive, the content itself sometimes feels hammily over-acted. Band members mug for the camera rather embarrassingly, and some of the intro sequences feel almost like a parody of a real rock concert. I'm sure the developers intended it to be tongue-in-cheek, but it is a little painful sometimes. Another weak aspect of GH Live is that the transitions between positive and negative can be extremely abrupt. One moment you can be doing well, but bungle a few notes and within a few seconds and a quick shimmer of the screen, you're watching yourself get booed by the audience, and are getting stink-eye from your band-mates. Playing well can quickly get you back into their good graces, but the transition is again very abrupt, and can be almost off-putting. While GH Live's career mode has a fairly familiar structural ring about it – play gigs, unlock more gigs – GHTV is a whole new ball game. This is an online mode that feels almost like MTV of yore – it features music programs that you can play along to, and the songs that are featured are supplemental to the music that comes on the disc. All shows are scheduled, and play out in realtime. All you have to do is choose which show you want to watch from the selection available – there are two channels running at the moment, and a third will apparently be added at a later date – and then play along to whichever song happens to be streaming. There are about 200 new songs available at the moment through GHTV programs, and Activision has said that more will be added each week. Unlike GH Live, instead of playing along to band footage, the background shows the actual music video of the song you're playing. More interestingly, you're ranked in real-time against other on- and off-line players on a leaderboard, which helps dial up the feeling of competition. Depending on how well you do at playing a song, you're awarded experience and in-game money. Experience essentially ranks you up and unlocks new note highway skins and GHTV features, while in-game money is basically a freemium currency that lets you buy "plays" – the opportunity to play GHTV songs on demand so you can build your own set list, should you so desire. You can also buy currency microtransactionally using real cash, as well as purchase a 24 hour pass, which lets you play unlimited songs on demand – which I imagine would be useful if you're holding a party or an event where you want to offer Guitar Hero Live's complete catalog of tunes for people to play. The freemium nature of this aspect of the game might sound somewhat off-putting, but it's not too bad. The downside is that you can't practice songs, unless you use one of your plays, and also means that you never own any songs – you just buy the opportunity to play them on demand. However, I've noticed that while playing GHTV, I've amassed plenty of in-game credits fairly quickly, and I have about 25 plays to my name. And to be blunt, I didn't really feel the need to rush off and play specific songs on demand. That's largely because the discovery aspect of GHTV is quite fun. Shows are centered on genres, and while one mightn't quite be to your taste, the other show that's playing usually offers something completely different. On the off-chance that nothing catches your fancy, you can always go and play GH Live for a while, or failing that, use a few precious plays to groove along to the songs that you really want to. It's certainly no worse than paying for downloadable songs – and I'm speaking as someone who's spent close to $150 on Rock Band songs over the years. Bottom line, Guitar Hero Live is a successful reboot of the series, and one that brings something fresh and new to the table. I do like the new guitar setup, and even though the buttons and strum bar are extremely clicky and noisy, they work well, and feel durable enough to go the distance. Indeed, the new six-button setup offers a whole new level of difficulty, and one that should appeal to music rhythm game veterans who are looking for a new challenge. GH Live mode isn't perfect by any means, yet despite its flaws, it's still a lot of fun. But it's in GHTV where the game really works well, especially as a tool to discover new music. The freemium model does complicate things somewhat, but I don't think it's too intrusive. The game offers sufficient options not to make it feel like it's weighing around your shoulders too much, and playing along to GHTV is entertaining enough that I think you'll earn sufficient credits to be able to occasionally play the songs you want without having to spend a dime. 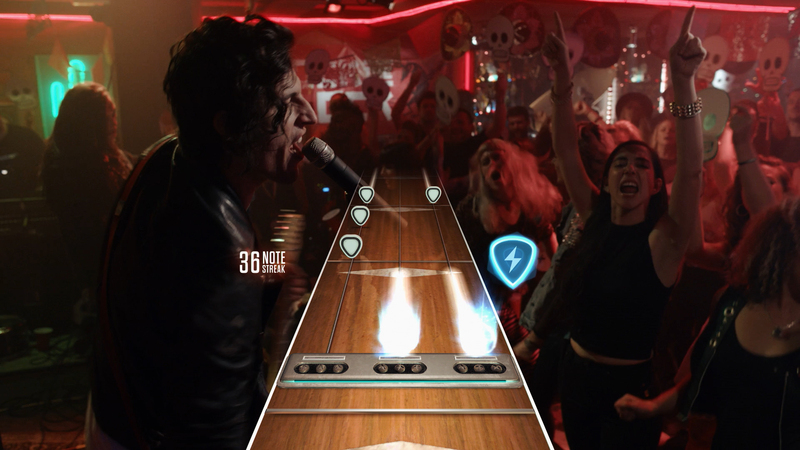 Guitar Hero Live is a great new start for the franchise – and I'm interested to see how GHTV will be built out over the coming months. Well designed to get you around the game quickly and easily. GH Live offers a solid challenge, but it's in GHTV where the game's long-term appeal truly lies. The standard setlist is a little disappointing, with few truly classic tracks - but GHTV offers a wealth of old and new music to discover. Very good quality video ensures that Guitar Hero Live looks great. 2015 IN REVIEW: The battle of the plastic guitar games recommenced this year. How do they both compare?